Kalamazoo, MI: On October 10, 2017 two armed robberies occurred that were committed by the same subject. The first occurred shortly after 9:00 pm in the City of Portage in the 10000 block of Shaver Rd. The second at approximately 11:15 pm in the City of Kalamazoo near the 2600 block of W Michigan Ave.
Detectives from the Portage Police Department and the Kalamazoo Department of Public Safety immediately began a joint investigation. 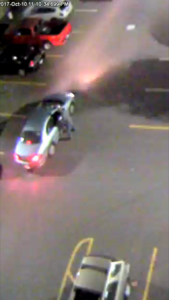 A news release was disseminated containing video footage of the robberies. 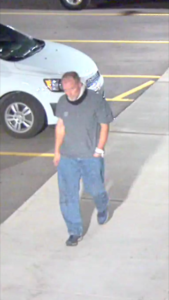 As a result, the Indiana State Police observed the video and noted the subject matched that of a serial armed robber in the Northern Indiana area. In a collaborative effort Detectives from the Indiana State Police, Peru, Decatur and Logansport Indiana agencies worked with Detectives from Portage and Kalamazoo. Information shared between agencies resulted in new leads being developed. As a result the suspect was identified as a 53 year-old Indiana resident. He was arrested in Plymouth Indiana earlier the morning by the Indiana State Police. The subjected is being held on charges related to multiple armed robberies in the Northern Indiana area, additional charges will be fourth coming. Update: On October 11, 2017 detectives and patrol officers from the Kalamazoo Department of Public Safety continue to investigate the above armed robbery. Through this investigation video surveillance from the targeted business and surrounding area were reviewed providing additional information in this matter. The Kalamazoo Department of Public Safety is seeking assistance from the community regarding the identification of this person of interest. Kalamazoo, MI: On October 10, 2017, at approximately 11:15 P.M., officers were dispatched to the Campus Party Store, located at 2627 W. Michigan Ave, in reference to an Armed Robbery in progress. A soon-to-be customer was on his way in to the party store when he noticed a man pointing a gun at the clerk. The witness ran back to his vehicle and called 911. Moments later KDPS received an emergency call from the clerk of the party store reporting the robbery. Officers later learned that a middle aged white male came into the store, armed with a handgun, and demanded money from the clerk. As the clerk emptied the register, as requested, he took advantage of a brief opportunity to disarm the suspect. The clerk fiercely reached for the gun and ripped it out of the suspect’s hands. The suspect scooped up as much money as he could fit in his hands before running out the doors. The suspect was seen leaving the area on foot, westbound on W. Michigan Ave. A perimeter was set up and a K9 track was attempted. Due to heavy rain and foot traffic the track was quickly ended and the suspect was not located. The suspect appears to be a middle aged white male. His face was covered with a black, tube style, cold weather mask. He was wearing an olive drab winter hat with jeans and a crew neck sweatshirt. Anyone with further information on this case is encouraged to call Kalamazoo Public Safety at 269-337-8120, or Silent Observer at 269-343-2100.